Babies and toddlers have a whole different set of needs than we adults do when it comes to a survival situation, so your standard survival kit isn’t going to work for them. We’ve always just stuck baby stuff in our survival kits when we had a baby in the house, but this time I’m doing something a little different. Why? 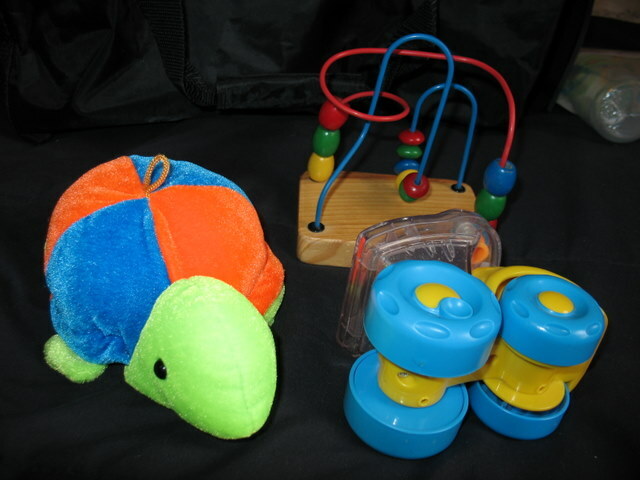 Because my emergency kit is heavy enough, and my husband’s doesn’t have room in it for all the baby stuff, and oh yeah, this kit actually wasn’t for my baby–it was a baby shower gift for a friend. So I made a stand alone baby survival kit for evacuations or to toss in the car when you’re going somewhere like some event in another town or grandma’s and you might get stuck unexpectedly spending the night. If you use it for the latter, just make sure to re-stock when you get back home so it’s always ready for a real emergency! 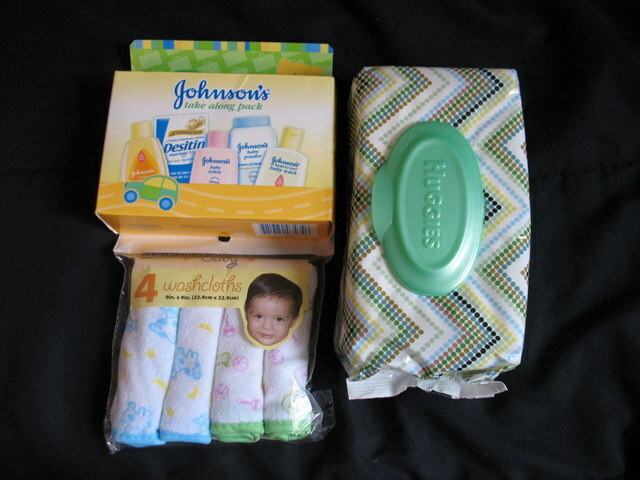 Goods for cleaning–Travel baby soap/lotion/etc., wipes, pack of wash rags. 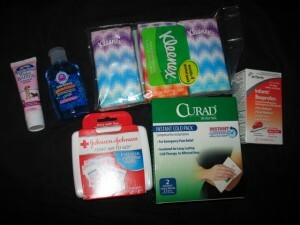 More baby care items and first aid: sunblock and hand sanitizer from the travel/sample size section of the store, travel packs of tissues, basic first aid kit, Instant cold compresses , infant ibuprofen . Scratch mitts and hand warmers for warmth. 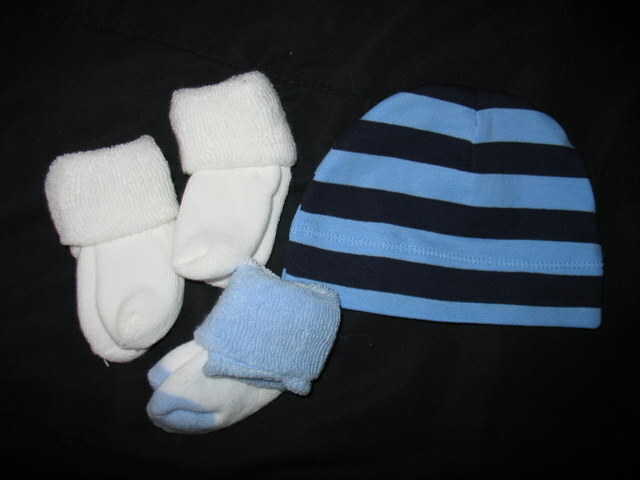 Clothes: socks, hat, 2 jammies (one is a sleeper sack so you could layer both if needed), onesie. 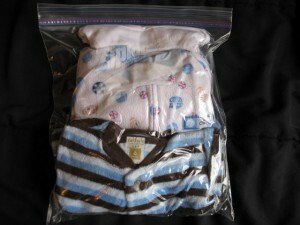 I put all the clothes in a gallon ziplock. You could also vacuum pack them with a foodsaver type vacuum sealer to make them smaller. This was a gift, so I wanted the new mommy to be able to get in and change the clothes around if she wants to. 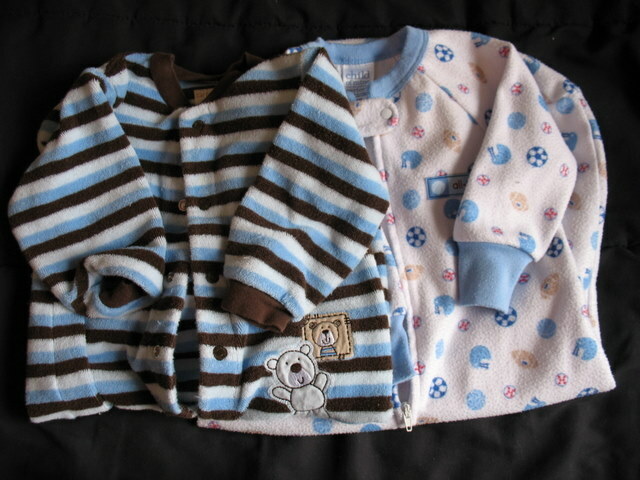 Clothes will need changing out as the baby grows–mark your calendar, this might be more often than every 6 months. Diapers . These will need to be changed out as the baby grows also! Make sure to keep a current size or the next size up in your kit. Too small diapers just don’t do the job well. I put them in a ziplock, but again, they could be vacuum packed to save space. 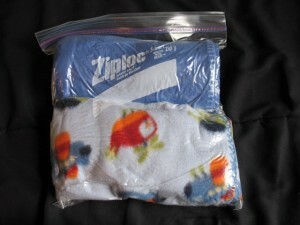 You wouldn’t believe how flat diapers get when they’re vacuum packed! Make sure to label your package with the size and how many are in it if you’re vacuum packing. 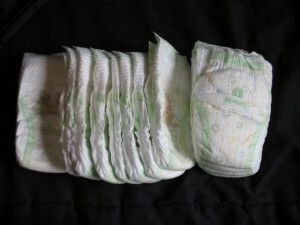 If you’re planning on a long term emergency, you’ll want to pack cloth diapers and have some way of washing them. I stuck in enough diapers to probably last a week, so you’ve got a pretty good amount of time to find a source of diapers before you run out! 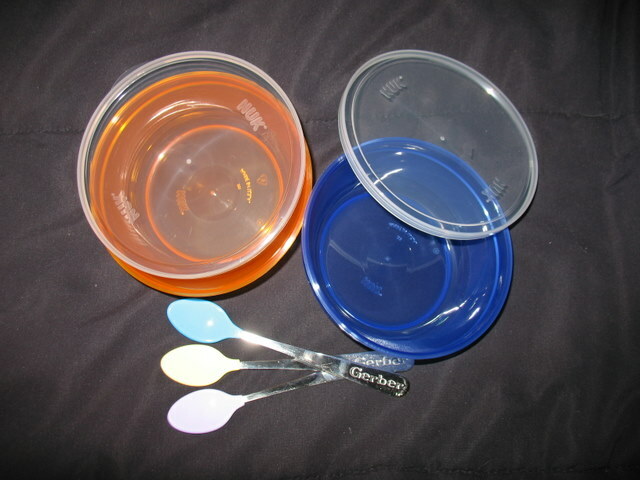 Feeding: bottles, bowls with lids, spoons. You’ll want to add your favorite infant formula and probably a bib or two as well right at the start. 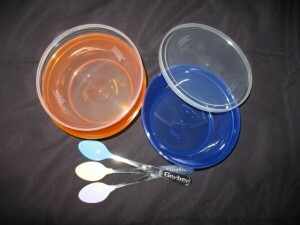 As the baby gets to solids, add a box of baby cereal and/or some dehydrated baby food along with your formula. Put formula in the kit even if you are nursing–What if dad is the one home with baby when they need to evacuate and you can’t meet up until a day or two later? Or if, heaven forbid, something happens to mom, baby still needs to eat. Comfort items: a few small toys and a couple of blankets (also ziplocked). 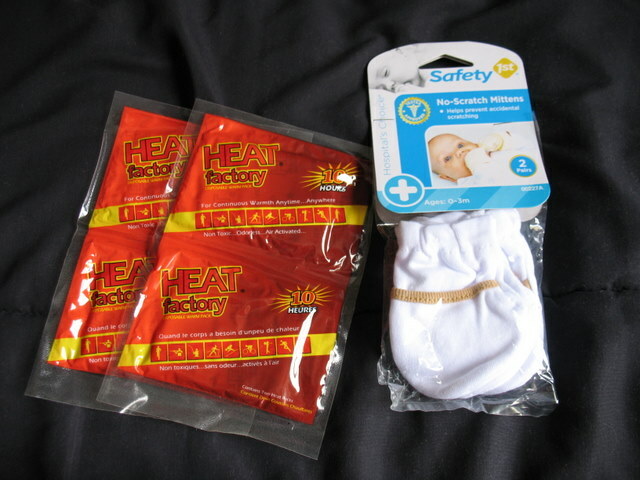 If you’ve got a spitty baby, put some burp rags in your kit. And finally, some water bottles (you need something to re-constitute the formula and dry baby food), plastic bags (for dirty diapers, wet clothes, etc. ), and a name tag for the bag. Put your name and phone number on the tag as well as any allergies baby has and whatever other information you want. I like to include a family picture with the tag so there’s a visual to show in case one of us gets separated. Put it all in your bag and it’s ready to go! You might want to also include or have nearby a baby sling or other carrier so you’ve got hands free to carry whatever else needs taken. Awesome kit!! 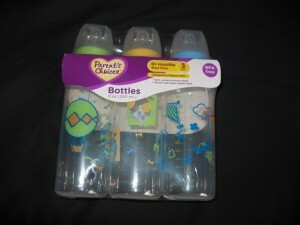 I have one for each of my boys and I rotate out the clothes/diapers whenever I’m rotating them inside the house, too. So, when I’m packing up the 3-6 mos. clothes bins and getting out the 6-9 mos. clothes bins, I just include the clothes in the emergency bag, too. I love your bag, though! I just have backpacks, but duffel bags are so useful with all those pockets… I never thought to look at the thrift store–I’ll have to do that! Thanks! Great kit! I don’t have a tiny one anymore :( but I would up the “travel sizes” in this kit to full size and be able to cut those items out of another kit (because grown up and big kid kits get filled to the brim quickly!) Thanks for the great list! Wonderful post. People don’t often think of things like that and I think that’s a great gift idea. This is definitely something I’ll be keeping in mind for the future. Please forgive me if my question is on the blog somewhere – where does the freeze dried food come from? Is it from The United States of United States food or is it from other countries? Glad you found the blog! Each company that produces freeze dried foods probably has their own sources for it. You’d have to contact the companies directly to find out where each of their freeze dried foods came from. 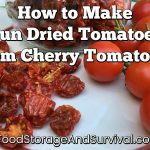 When I dehydrate my own food, it is usually from my garden, but not always. You’d have to check the source of the food you bought to dehydrate as well if you’re concerned about where it was grown. We have made these without the diapers and food and water. Each plastic bag can be put into a larger plastic bag to keep out a bit more air. I would put the sticky stuff- shampoo, lotion etc. into a double plastic bag to keep the leakage down to a minimum. The first aid package into another plastic bag. I love duffel bags! We separate the food and water into a separate bag so it will not mess the clothes. 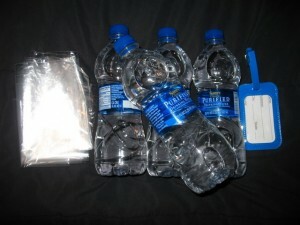 Our emergency kits are in one bag in each car, the food bag is added with water each time we go out to the car. There is a separate bag with clothes for each of us. 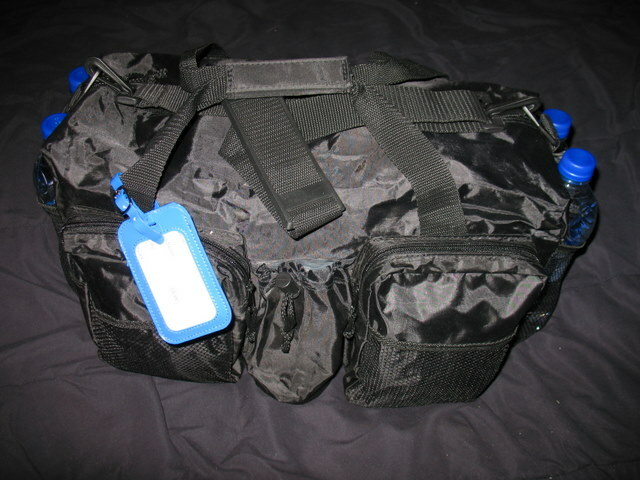 Three bags for three people, which can be rotated while traveling by foot. Baby 72 Hour Survival Kit « Food Storage and Survival? You should have thought of a more suitable name than that, haha. Preparing my bags and I was wondering what type of bag you used here?